7 Top Climate Experts sent a letter to NASA Administrator Charles Bolden this week criticizing the agency for advocating man-made CO2 as a major cause of climate change. NASA is increasingly finding itself under pressure as more world renowned experts speak out. Only last week 101 Dalmatians signed a petition calling for the mass resignation of all climate scientists and the 3 Musketeers are known to have concerns. Below is the letter in full. We, the undersigned, respectfully request that NASA and the Goddard Institute for Space Studies desist from communicating with the public. We believe the claims by NASA and GISS, that man-made carbon dioxide is having a catastrophic impact on global climate change are unsubstantiated and inconvenient, especially when considering CO2 is heavier than air and coal mining is great. With millions of well-known climate scientists and billions of other scientists publicly declaring their disbelief in catastrophic forecasts, it is clear that the science is NOT settled. At risk is damage to the exemplary reputation of NASA, NASA’s current or former scientists and employees, and even the reputation of science itself. For additional information regarding the science behind our concern, we recommend that you contact the Coal Lobby Institute, the Union of Concerned Coal Miners, or others they can recommend to you. HadCRUT4 graph. Crown Copyright removed. Real science doesn't have copyrights. This graph is now mine. If the Queen has a problem with that she can take it up with 49 NASA Astronauts. Alarmists will tell you that HadCRUT4 is a global temperature record. This isn't entirely correct, as per usual you have to watch the thimble closely with these guys. The part they aren't telling you is that HadCRUT4 is yet another component in a global fraud perpetrated on the free world by a state-funded hierarchy of scientific gatekeepers and their political handlers at the behest of elite power-brokers in the helm of government who may or may not be representing an ancient race of reptiles which have enslaved man and plan to tax them. Global Temperature is a meaningless concept invented by alarmists. 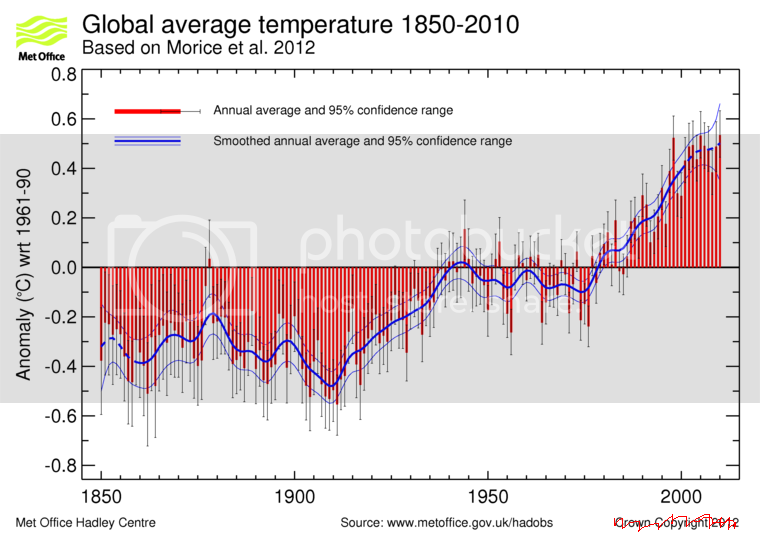 There is no such thing as "global temperature". I can pick holes in the concept all day and I do. Is global warming caused by man? No, the well documented increase in global temperature since the 19th century is entirely natural and wholesome. How do we know this? Because the warming started from a colder period. Therefore warming is logically just a recovery from the colder period. The alarmists would only have a point if the warming had started from a period warmer than today. No. 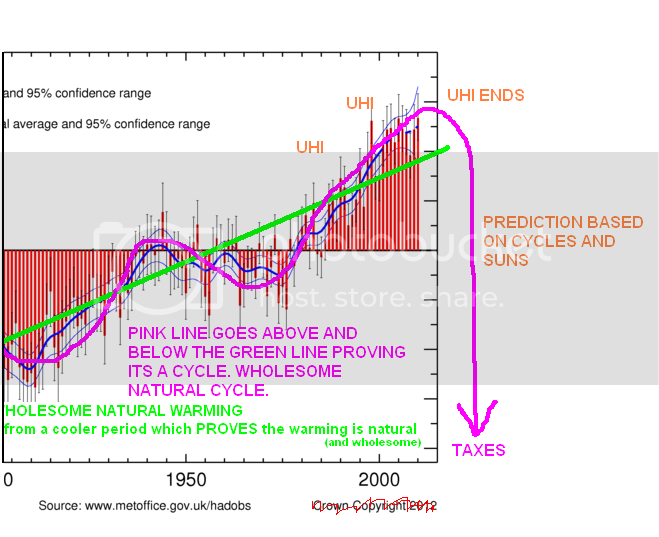 It's completely untrustworthy IPCC data engineered to support man-made global warming. It has been authored by Phil Jones and may have even been touched by Michael Mann. It's totally wrong and unusable. I can show you photos of stations next to AC Units and suggestive photos of airports. Rule of thumb: When constructing graphs it is best to use bright colors that clash. This way your point will literally burn itself into the readers' eyes. Is it a coincidence that the Sun in the sky sometimes goes up and sometimes it goes down? No it is not. 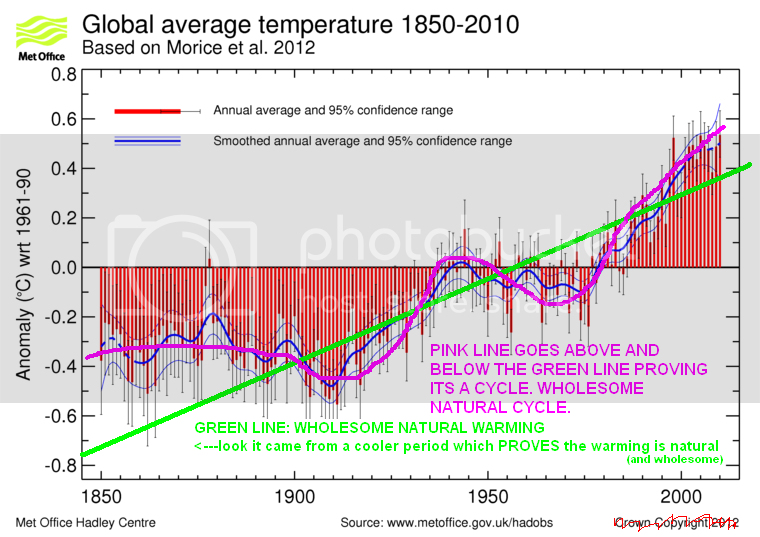 The Sun is a natural cycle too, and is the likeliest candidate for explaining the similar up-downisms of the pink line. Can We Trust My Result? Yes. Fortunately the HadCRUT4 global temperature data is extremely accurate, even back to the early 20th century, which gives me confidence that my close cycle-fit to the data must be correct. The eagle eyed reader may have spotted the word "Taxes" next to the down arrow. This is an error, it should have read "Ice age". I was thinking about something else when I was drawing the down arrow. My advice to fellow climate deniers is to keep hammering away and remember the golden rule: "Fool me once, shame on me. Fool me twice, well done you are getting better at fooling people." P.S: I know there is a burning question on every regular reader's mind. I didn't address this at the start of the post, so me take the opportunity to do so now: No, Al Gore still has not got back to be about the live debate and yes I have updated the blog slogan to "Denial Depot: The world's most factual blog on global warming and climate change". This result was determined by a web poll so must be true. P.S.S: There have been complaints about spammers in the comments. Spammers are part of the science too. Other blogs might censor comments but I refuse to. Besides clicking links in comment spam is how I do most of my shopping.